Energy Trust offers several standard incentives for water heaters in existing commercial buildings, including multifamily buildings. Here are answers to some frequently asked questions about the standard incentive for water heaters. Q: What are the standard incentives Energy Trust offers for water heating for commercial customers? 1Effective for equipment purchased on or after May 15, 2018. Available only for Oregon commercial customers. Check the Existing Buildings standard incentive brochure for more details. Q: For what types of facilities is the standard incentive available for commercial tankless water heaters < 200 kBtu/h? Q: The product brochure for my water heater says that it is a boiler. 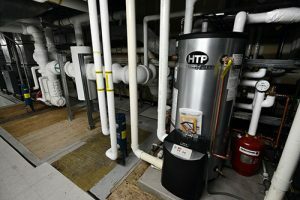 Am I eligible for the standard incentive for boiler equipment for this water heater? A: It depends on the primary use of the equipment. Avoid basing your decision solely on product brochures or equipment sell sheets. If the primary use is domestic hot water, then your water heater may qualify for standard water heater incentives. If the primary use is space heating, then it may be eligible for the standard incentive for boiler equipment. Please review the eligibility requirements for each equipment type and contact us to confirm before advising your customers on incentive eligibility. Q: The tankless unit that I want to install includes a holding tank. Am I eligible for an incentive for water heating? A: It depends. There are a number of variables in making this decision. Contact an Energy Trust trade ally coordinator to help find the best solution for your customer’s project. Q: The tankless system that I want to install is a rack system, with more than one tankless unit. Would this be eligible for the $300 incentive per unit? A: Yes. The customer’s tankless system is eligible for $300 per unit installed. When installing multiple units in tandem, the incentive may be $300 for each unit installed (e.g., 3 units installed in tandem may receive up to $900 or, $300 multiplied by the number of units in the rack system installed in tandem). For more information, contact Alex Snook, trade ally coordinator, at 503.407.7286.